Offering you a complete choice of products which include 5 in 1 car emergency torch hammer and multi function amazing car security tool. 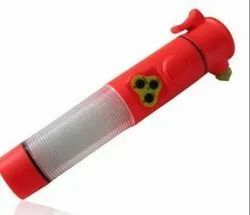 We are leading supplier of Emergency Torch Hammer. 1) 200m long distance illumination and none shading pipe. 2) It has safety belt cutter which can cut the safety belt off easily in traffic accident when the safety belt cannot be released. 3) With window breaker which can break windows of car in case of being boxed . 4) With flashing function which gives out endangering signals. 5) Can be attached firmly to any iron objects, including top of car, with built-in magnet . 7) Uses 2 AA batteries. 8) Practical for car use in emergency. 9) Beacon time: 36 hours flashing with 9 LEDs. 10) Lighting time: 24 hours with one super bright LED. We offer Multi Function Amazing Car Security Tool. 1) We are highly specialised in costmised printing on the product. 2) Accidents and emergency situations happen and it's always good to be prepared, more so when driving a vehicle. 3) This is a must-have accessory and multi-tool for your car. It has 5 functions that are useful in such situations. 4) You can use the safety belt cutter to release yourself from the seat. If stuck in the car, you can use the hammer for breaking the windshield for getting out of the vehicle. If the car breaks down, you can use the beacon, warning light or alarm speaker to warn other motorists of the situation. 5) With 5 Useful functions, this is a great accessory to keep in the car. 6) This tool runs on 2 AA batteries (not included).